Futbol para la Vida ambassador Emmanuel “Manno” Sanon passed away today in Orlando after a long battle with pancreatic cancer. Manno was born on June 25th, 1951 in Port-au-Prince, Haiti, son of Darius Sanon, from Jacmel, and Cherisna Fortune Sanon, from Kenscoff. 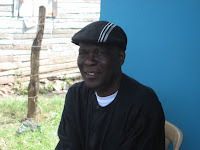 A schoolboy football sensation at Don Bosco, he made his debut for the Haitian national team at 18 years old in the 1970 World Cup qualifying, and his goal scoring exploits over the next decade left him as Haiti’s career top goal scorer. He had a successful international career in Europe and the USA where he played against the top football stars of the day. Manno’s goals in the 1973 CONCACAF tournament helped Haiti become the first Caribbean nation to qualify for a FIFA World Cup. At the 1974 World Cup in West Germany Manno scored goals against Italy and Argentina, with the first goal voted as the goal of the tournament. His goal against Italy was well remembered and replayed frequently during the festivities at the 2006 World Cup in Germany, and France Football named him as one of the Top 100 World Cup players. His autobiography “Toup Pou Yo” recorded the 1974 World Cup from a personal angle, and he was named the Haitian Athlete of the Century in 1999. After retirement in 1983, Manno coached youth teams in San Diego, Texas, and Orlando, as well as the senior Haitian national team. He started the Foundation Emmanuel Sanon FONDESA, dedicated to empowering young people to reach their potential by supporting community-based programs promoting health, education, and welfare. He also worked with other international humanitarian organizations, most recently visiting Haitian bateyes in the Dominican Republic in late 2007 with Futbol para la Vida, an HIV/AIDS prevention education program of the international Grassroot Soccer network. Emmanuel Sanon is survived by his wife and four children. In lieu of flowers, donations should be sent to FONDESA at mannosanon@aol.com. Call to Dominican presidential candidates to address rights of Haitian migrants	2nd Annual Magnolia’s Burlington benefit concert, Thursday, Feb. 28th, 8 p.m.